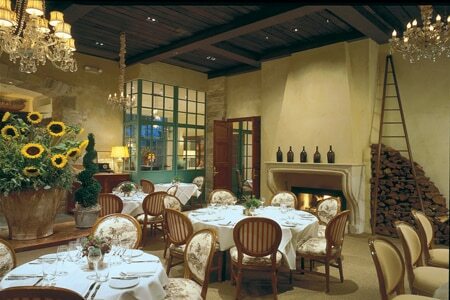 Elegant food and French country style are present in this Patina Group restaurant in Costa Mesa. : Pinot Provence has a woodsy, French country-style décor that creates a warm, intimate setting for the lunch and dinner crowds, which tend to be a good mix of locals and hotel guests. The restaurant's unique daily brunch program allows true brunch aficionados the chance to indulge in this singular meal without having to wait for the weekend to do so. Others stop in for a business-fueled midday meal. Patina Group veteran Alfonso Ramirez, who spent time at L.A. restaurants Spago and The Foundry, oversees a dinner menu that strikes a chord between Old Country cuisine and new-world sensibilities. This mindset is reflected in starters like sautéed frogs’ legs with black garlic purée or the Spanish octopus salad with confit potatoes and fermented cabbage. Traditionalists enjoy the braised short rib with English peas and baby carrots, while seafood fans may opt for the poached Scottish salmon with French radish and Calabrian chile. Desserts are good, too, especially the house-made ice creams and sorbets. The wine list is properly stocked for a fine French establishment.